Hey, sports fans! We know you read Kotaku. Or, at least, some of you care about sports. Maybe even care about Madden. So you'll find this of interest: with the Packers QB being traded to the Jets today, it leaves EA in a pickle. 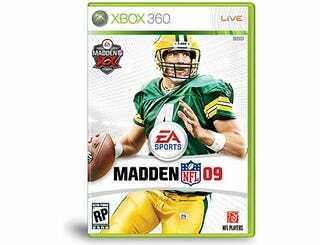 They'd put him on the cover of Madden 09 in a Packers uniform, convinced - like everybody else - that he'd stay retired. So with Favre now due to suit up (or at least hold a clipboard) for NY this season, what are EA going to do with the cover? The game's not out yet, they can mock up a new, Jets-branded image, right? Nope. They're just going to leave it, a testament to a time when Brett Favre was going to be remembered as a future Hall of Fame QB, and not the meddling star of a modern-day sports soap opera.